← Jumping back in the deep end! …you know, Wednesday, downhill all the way to the weekend. It’s been a crazy couple of weeks, hence the lack of posting. My bad. Picked up a new contract, was only mean to be two weeks (PA to MD) temp work to refill the coffers, but transpired to be a little more than that. They’ve retained me ‘officially’ for a further week, but the lady I’m supposed to be covering for is back at work. They didn’t sent me away, instead they put up a desk and pc for me, right outside his office. He gave me a project to manage, which frankly will take awhile. I guess they like what I can do eh? From what I’ve learnt he’s a canny chap, always employs this way (via temping) and basically keeps them if they’re good. It’s a great office, real family atmosphere but doubling in size this year, company doing very well. Will find out next week what’s transpiring for definite, so wish me luck! Meanwhile, I’ve 3 readings to do for http://www.dktarot.co.uk and 2 pieces of work to do for http://www.e-secretaries.co.uk …it’s all go. Days and evenings, just a little crazy tiring. Still, it’s all good! Finally crawling out of the financial dirth we’ve been in since the past year kicked our proverbial butts. Meanwhile we were in London this past weekend for a smashing workshop and party for Sacred Pleasures, great fun. Thanks to the inimitable London Faerie for organising that. Zumba and the gym (and cinema nights!) have gone by the by due to being so busy and exhausted, but I plan on re-introducing them as soon as my body’s caught up. Must keep up the weight-loss and fitness after all the good work! Right that’ll have to do, it’s late, I need sleep. Couple of pictures first though, to brighten the post a little. 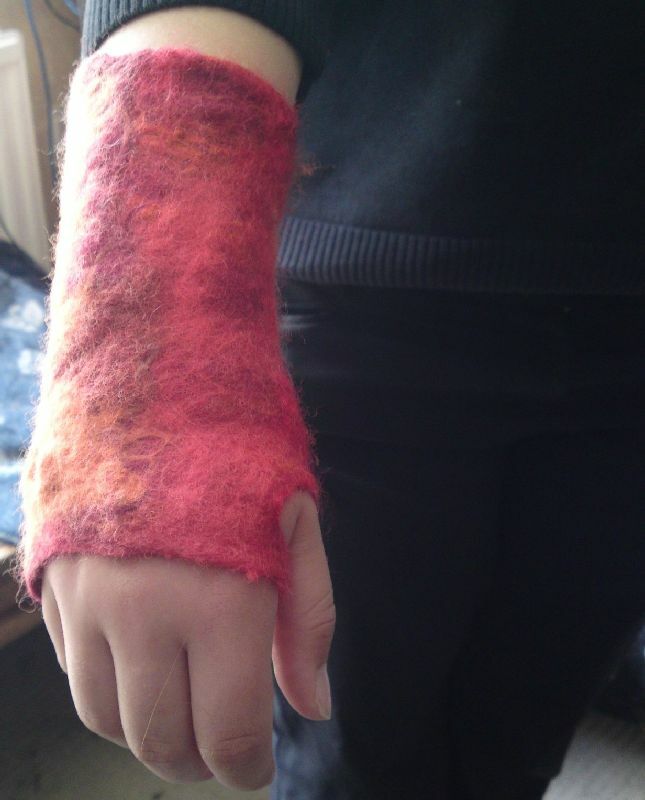 This ‘glove’ was felted by my crafty mum Gina, isn’t she clever? It was a gift for her birthday on July 8th. 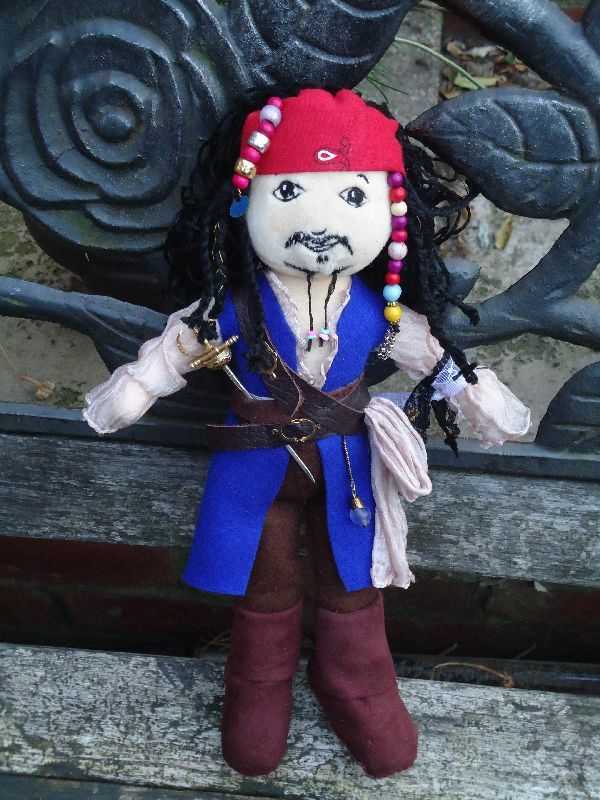 This one was a ‘Jack Sparrow’ (Johnny Depp) that I made for Lina’s birthday too. Isn’t he cute? I was pleased with him and she certainly seemed so.